Challenge 4 sponsored by INM asked our Top 9 to examine their own heritage and create their own set of “International Nails” inspired by the country (or countries) of their family’s origin. The design was to cover five nail tips and they were also asked to shoot a short video showing us how they created the nails. This week’s guest judge was Lorena Marquez of INM. Permanent judges include CND’s Jan Arnold, NAILS Next Top Nail Artist 2014 winner Ryoko Garcia, NAILS editor Hannah Lee, NAILS senior editor Beth Livesay, and the rest of the team at NAILS Magazine. Lavette Cephus: The judges love your sculpted African mask. It actually looks like it’s made of wood. These nails are bold, beautiful, and artistic. Your handpainting skills are really impressive and we think it’s one of the best designs we’ve seen from you. The map of Africa with the safari sunset is gorgeous. Each one of your nails individually is so colorful and pretty, but there isn’t a cohesive connection from nail to nail. Your detail work on your tribal patterns and overall is spot-on. We also wish there was a bit more of a personal connection to your design. Your video is a bit blurry in parts and hard to see because it looks like it’s shot upside down. Try shooting a more consistent video with smoother transitions. The sound is improved from last time though. 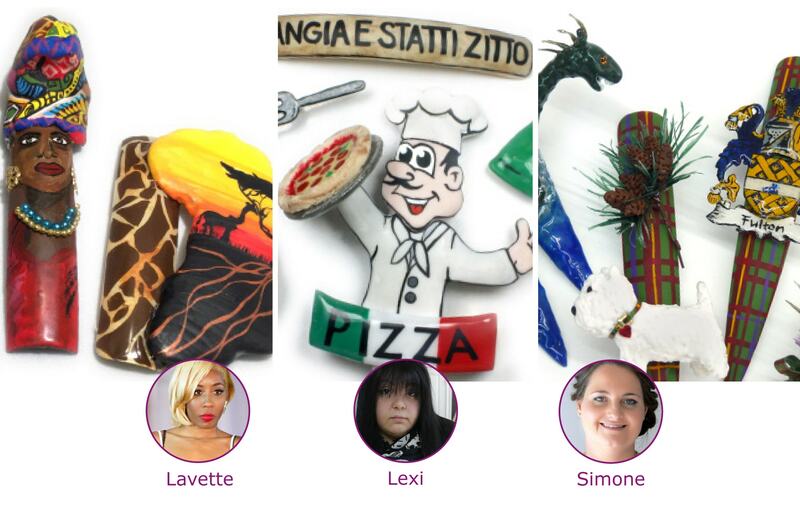 Lexi Martone: As you can imagine, the judges were blown away with your mechanical spinning pizza. (Plus we loved watching how you created the pizza from start to finish.) Your design is cute and whimsical with crisp lines and fun details. Your technique stays true to your style. You used a variety of techniques, but our only critique is that we’d love to see more sculpted details. Perhaps instead of handpainting the chef’s face and body you could have sculpted that for more dimension. That said, your freehand painting is beautiful. We also love the pouring wine. What a fun video. It was easy to follow and tight — great choice of music too. Simone Gilbert: The judges were once again impressed with your mastery of different types of medium in this challenge. Your gel and acrylic skills, as well as your handpainting skills, are top-notch. The craftsmanship and attention to detail on the thistles and pines is so cool to watch. We love your handpainted tartan and the flexible gel “fabric” you made to create the bow. And the handpainted crest is crisp and clean. The texture on the dog is great too (you didn’t even scrimp on the details on his collar). While your Loch Ness monster is impressive in the detailing, those two nails feel a little separate from the rest of the design. Your video has nice instructional elements and tight shots so we can really see your work. You might use a mic or your iPhone earbuds plugged in to improve the audio on your intro so it’s more consistent with your voiceover. Danielle Costantino: The judges love the detail of shape and texture on your map elements to show elevation and terrain. Your lines are always crisp and clean. And it was nice to watch you create the lovely background of the nails. Your video is getting better, but it could still use some tightening up. The judges were torn on whether your design was too simple or if the minimalist design was elegant and effective. One judge said she would have liked to have seen more realism by perhaps making the flags appear to be waving and the flowers to come to life more off the scroll. Several of the judges suggested more elements to represent the countries. Just having the maps and flags seemed like you were playing it too safe and the scroll and flowers don’t shout “old world” Europe. Lauren Boyd: The judges were impressed with your handpainting skills and all the details in the portraits and backgrounds on the nails. We really like how you incorporated your actual heritage with your grandparents and mom. The colors are really nice and we love your story. The sculpted figures seem a little bulky and not smooth enough. They don’t feel as detailed and cohesive as the rest of the design. Thank you for breaking away from your usual graffiti style to show us a different side of your techniques. Your video is better than the last one, but we still would like you to zoom in more so we can see the detail of what you’re doing. Sherri Traweek: The judges loved your details on the windmill and castle. (Each little acrylic stone really gave that castle a realistic feeling. And the moving windmill was a nice touch.) Your design also flows nicely across all five nails even though you’re representing three different countries. Great idea to put the flags peeking through as the base of the nails. We appreciate that you used color acrylic to create your design instead of just handpainting the details. Your demo and personality are the star once again. We love your humor and easy-going quality that you put into your videos. The judges were torn over whether certain aspects of your design were too simple (no details on the tulips, not enough detail on the Berlin Wall) but overall, this design is cohesive, clean, and cute. Karrie Bowers: The judges appreciate that you took our previous suggestions into account with this challenge. And we love your story and how you came to select your own heritage! The three nails with the tartan pattern are beautifully created. The glass of whiskey is great, and the knife and pouch are also very well sculpted. We can see improved skills in those elements. Where you lost us is on the nails with your greenery, lake, and Loch Ness monster. That section doesn’t have the same attention to detail as the other three nails and seems a bit basic. We’d like to see more detail in the creature and land elements. Your video was better this week, but you could have tightened it up a bit more. Good use of music and inspiration photos. We’d like to hear more voiceover to explain the step-by-step with the entire process. Lini Sherburne: The judges like the attention to detail you put into your overall design. The maple leaf was so realistic, and the intricate pattern on the egg was tight and detailed. We also love the stacking dolls concept and that you used different sized nail tips to create those. Your technique for the sculpted crown was also impressive. You’ve really stepped up your skill set since the beginning of this competition. The main critique with this piece is that the elements don’t seem to come together in a cohesive way and it feels like you could have tied the entire design together better. Your video is good and you have a nice video presence. Marisol Alvarado: The judges like your use of color to depict the Mexican heritage. And the details on your tacos was so fun to watch in your video. You were ambitious this week, but there is too much going on. Your overall design is cluttered and hard to focus on specific elements. This would have benefitted from editing out some of the pieces. Perhaps you could have picked Mexican food to focus on or Day of the Dead or the musical elements, but all of them together is just too much. The video was a little too busy and not steady enough. Try speeding up your video instead of using transitions that jump.